The IMF Is Talking Just like Wells Fargo Did. Stop These People! The IMF has come out for implicit guarantees of mortgages, no matter whether Fannie or Freddie are privatized. I have always argued that the international bank is a diabolical organisation, a wing of the international bankster cartel made up of the IMF, the World Bank and the Bank of International Settlements (BIS). Now the true colours of the IMF are showing and taxpayers in the United States need to run for cover. The IMF wants the now defunct securitization market to revive. The IMF wants privatization of Fannie and Freddie, with implicit guarantees from the taxpayer or a public Fannie and Freddie with explicit guarantees from the taxpayer. As Wells Fargo has threatened, this revival of securitization through private TBTF banks taking some of Fannie and Freddie business is impossible without implicit guarantees of all loans, not just subprime loans. Wells claims that investors won’t buy the bonds. But this results in a massive moral hazard with regard to taxpayer liability. Taxpayers should not have to incur these risks. That is what banks are for! If they would write mortgages that are properly underwritten, investors should not fear. I think that by seeking guarantees, the banksters want to abdicate responsibility for writing good mortgages. They would rather jumpstart a bubble in real estate once again! But note, the world banking cartel wants either implicit or explicit guarantees of all mortgages. As it is at the time of this article, Fannie and Freddie are guaranteeing 9 out of 10 mortgages written, and the banksters want to keep some required guarantee in place even if Fannie and Freddie are wound down, so that Joe Taxpayer can remain on the hook. The reason the IMF is so anxious to get the securitization market and easy money flowing again into mortgages is that household formation has dropped in the United States from 1.1 million at the peak to 600,000 for 2008 through 2010. The IMF obviously hates the new frugality and has so tipped it’s monstrous hand. America needs frugality and needs to repair the balance sheets of each family hurt by the preplanned housing Ponzi. America is tired of being manipulated by the international bankster cartel to pad the cartel’s wallets! Congress apparently is concerned that the India/China boom, being fuelled by credit from the TBTF banks, will end badly. So, the international banksters have called for more debt piled on in the developed world. This madness came from the World Economic Forum in Davos! The solution to massive debt is to double world debt in the next 10 years, according to these crazed madmen. If you remember that debt is money in the pockets for banksters, then you will realise that these people could care less about the solvency of you or I or of your children. Debt slaves are the way these people make money. The rich oppressing you is the call for a doubling of world debt! This is such a joke. Only it isn’t funny, really. The powers that be are floating an insurance fund, similar to the FDIC, to protect mortgages in the event of a market meltdown or other catastrophe. Only problem, most of the skin in the game is still Joe Taxpayer! And not only would MBS, mortgage backed securities be protected, but so also would credit cards, auto loans, and just about any other asset backed security (abs) out there. This would create easy money everywhere and moral hazard without peer! Yet, because the borrower and the mortgage originator has skin in the game that is supposed to protect the taxpayer? Likely story. 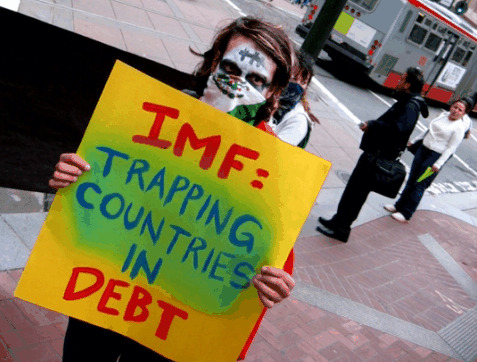 So what does the IMF really want anyway? We know they want austerity. They profit off austerity and by making loans to distressed nations. We know that they want securitization, as their buddies in crime make money off investors and borrowers. Banks make money originating loans, selling them off one to another to another, and by servicing the loans. Heck, they even make money getting the houses back and through government bailouts. These banks make money hand over foot and charge usurious interest rates to boot! It would seem that the IMF wants governments to cut spending so that securitization can be absorbed if anything goes wrong. I think that is the main scam of the IMF. They want to start securitization in countries that cannot absorb the losses, unless you quit helping the poor and sick. Yeah, what a great organisation of greed is the IMF! Watching the foot soldier of the IMF/BIS/WB, Ben Bernanke of the Fed on CNBC certainly is a sickening experience. Congressmen are fawning over him for stabilizing the economy but no one is blaming the Fed for destabilizing it in the first place! That is so wrongheaded! The Fed let the Ponzi lending from unregulated off balance sheet banks proceed when it could have stopped that lending. But we know that was part of the scam. And Bernanke says that those that securitize, ie, the investment banks, should have some risk for the mortgages they bundle up into bonds. But if things were fair, they would have all the risk, yet he still wants the US government to be the “backstop of last resort”. Give me a break Bernanke. We aren’t fools. We see through that BS. The investment banks would just reserve a little cash for the catastrophe that they cause in the future. And the government “backstop” would happen even as Fannie and Freddie’s work was privatized. Bernanke is on the same exact page as the IMF and Wells Fargo in extorting government and taxpayer liability! If you think that the Republicans are for helping Joe Taxpayer at the expense of the banking cartel, you need to quit smoking funny weed. The Republicans are for winding down Fannie and Freddie, but they are not for stopping the banksters from making money at taxpayer expense. Yes, the American Enterprise Institute has called for a split of Fannie and Freddie into two parts, with private mortgages and a public subsidy for limited rural mortgages and the like. But the banks are threatening this idea of no guarantees of private mortgages, and most Republicans would not want to see the demise of the 30 year mortgage, knowing that they would likely never get reelected. As long as the IMF is interested in the restart of securitization, then the taxpayer will have most of the responsibility for mortgages in this nation, as we are held hostage by the banksters. They say, guarantee them or we won’t write them. Wells has done that as I have argued above. Certainly the IMF will not get in the way of the Wells threats, because they want securitization too. I say ban the securitization of mortgages. It seems now that there is no other way to keep the crooks from ruining America. The Rest of the Article, Great Videos and Links were first published at Hubpages.